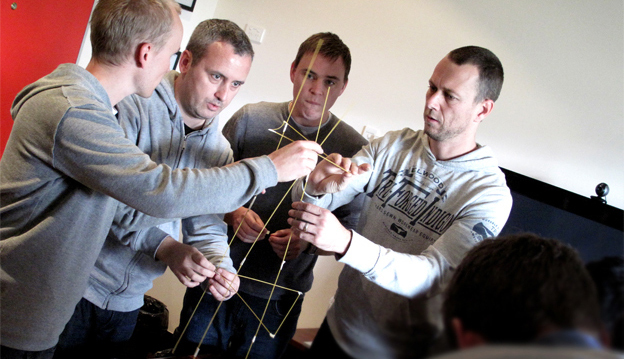 Most people in the Agile community are now familiar with the Marshmallow Challenge where the primary purpose is a lesson in collaboration and communication (according to the website), but for me the key takeaway is the need to prototype and fail early. In one of the post events in Agile Australia 2011 Thoughtworks took a different slant on the game and applied a twist of seeing what happened if you distributed it. Rixt Wiersma was the co-creator of the game and I was lucky enough to have a talk to her before and after the challenge. Taking what was used in that event and then adapting it even further creatively I have an advanced version of this game whose sole purpose is to teach to distributed teams the impact on communication rules and outcome. The result of this is below. Time required: 20 minutes actual game play, 10 mins setup/explanation time, 5-10 minutes debrief. Participants: Six teams of preferably four, but can be scaled up. If you have less than 24 then reduce team B and then D.
Materials: In addition to the standard Marshmallow materials, a notepad with removable paper and a pen is required. Team E will require two working mobile phones. Inform the teams that the point is not to learn about prototyping early, it’s about learning the impacts of distribution. As such they need to feel comfortable to use the Marshmallow early in the challenge. Teams A-E are split in half, the first half is called ‘Alpha’ and second half ‘Beta’. Change the names to cities if you want. Team A: No collaboration even at minute 0. Beta is removed from the room immediately. No crossover time allowed, no communication allowed on switch overs. Team B: Alpha and Beta are invited to collaborate for the first 2 minutes and then Beta is asked to leave the room. No crossover time allowed, no communication allowed on switch overs. Team C: Alpha and Beta are invited to collaborate for the first 2 minutes and then Beta is asked to leave the room. No crossover time allowed, communication on switch overs is allowed but only via notes. Team D: Alpha and Beta are invited to collaborate for the first 2 minutes and then Beta is asked to leave the room. The teams are allowed to talk for 30 seconds at the beginning of switch overs. Team E: Alpha and Beta are invited to collaborate for the first 2 minutes and then Beta asked to leave the room or move to the other side of the room. Alpha and Beta are allowed to observe the other team via other communication methods – this can be done either via a video/tv hookup or simply by letting them stand at a distance and listening in over a phone. Team F: Alpha and Beta are never split. Timings: Switch overs between Alpha and Beta happen at minutes 7, 12, and 17. At minute 17 the team being swapped out can observe the outcome of the last 3 minutes (in silence). The crux: Introduce a requirement at minute 10 to not just have one point with the marshmallow on top but to have a second point at a similar height (ie two towers as part of a single structure). You might need to up the spaghetti sticks to allow this to happen from the norm. I would love to hear back from you if you have given this a go. Really clever thinking, Renee! Really like your additions to the original game… Will let you know how it went after I give it go with my team!